COLEBROOK, NH (Aug. 19, 2007) – On a fine summer’s day not too long ago, a church group that had traveled halfway around the world on a mission throughout the northeast paused in front of the handsome stone monument that pays tribute to four people beloved in their communities and taken too soon from them 10 years ago today. They were 35 young people, members of a church group from Seoul, South Korea and the Rev. Shirley Stevens of the River of Life Church had taken them on a tour of Colebrook. They were told the story of Aug. 19, 1997, a day when horror struck this town, leaving behind an irrevocable loss. They fell silent in prayer. Today is the 10th anniversary of one of the darkest times not only in Colebrook, but in the neighboring communities that reach up the Connecticut River, from Columbia to Pittsburg. Ten years later, it is still difficult for many people to contemplate and speak about, for such was the violence, the suddenness and the utter sadness that followed. Many keep their thoughts to themselves and today, like last year and the years since then, they will leave town and pass this day somewhere else. And yet the memories of the four people who died that day are alive and held dearly by those who knew them. In small towns, everyone knows everyone else and in a thousand different ways, those who made a difference are never forgotten. Aug. 19, 1997 was one of those gorgeous late summer days, when the heat and humidity of previous weeks had broken and puffy clouds lazed in the blue sky. It was a day that belied what would unfold that afternoon. Carl Drega of Columbia, who had had a lengthy history of conflicts with town officials over his home and chunk of riverbank beside it, was driving his ancient pick-up truck through Colebrook. State police Trooper Scott Phillips, spotting the truck in the parking lot of LaPerle’s IGA, went to cite Drega for the large rust holes. Fellow trooper Leslie Lord had followed the younger trooper into the lot. Within moments, Drega erupted from his truck, firing an AR-15, striking Phillips and then Lord as he got out of his cruiser. Drega commandeered Phillips’ cruiser and bulletproof vest and drove a minute or two south on Route 3 and pulled up at Bridge Street, in front of the offices of the weekly News and Sentinel, which was where Bunnell, the Colebrook District Court judge and an attorney, had her office. Bunnell, who had been a selectman in Columbia and at whom Drega had once fired a round over her head when she went to talk to him about an assessment at his home a few years before, spotted him and ran across the hall to warn the newspaper staff, busy on the deadline Tuesday. As she ran out the back door, Drega shot her. Joos, the editor of the newspaper, wrestled with Drega, but was overpowered. He, too, was killed. In the hours that followed, Drega, still driving the cruiser, returned to his home and set it on fire. Scores of law enforcement from all branches – state police from two states, the U.S. Border Patrol and Fish and Game – descended on Bloomfield, Vt., where a gun fight broke out, before Drega was shot dead. As the moon rose that night, five people were dead and three were injured. Main Street in Colebrook teemed with people seeking answers and solace. As darkness fell, it was nearly impossible to make telephone calls because of jammed lines. Over the next few days, investigators would find 86 pipe bombs, an arsenal of weapons and a surveillance system tucked into birdhouses on Drega’s property. The News and Sentinel, which Joos had been editing that afternoon to meet the publication deadline that night, made it onto news stands the next morning. Ten years later, Harrigan said Bunnell, Joos, Phillips and Lord are all remembered, once people get past the horror that took them. He was often asked to describe the magnitude of the loss of four people who were such a part of the places they lived. “I said it would be the same as if you took 5,000 people out of Manhattan – that would be the impact,” he said. Bunnell and Harrigan were longtime friends. Her office was the same office his father kept when he was the Colebrook District Court judge and had a law practice. To this day, Bunnell’s black judge’s robe is draped on the coat rack where she last placed. In the months and years that followed, Colebrook, Pittsburg, Columbia and Stewartstown set about remembering and honoring the four people they had lost. Stretches of Route 3, where Phillips and Lord had patrolled, were dedicated in their memory. The Stewartstown Library became the Dennis Joos Memorial Library. 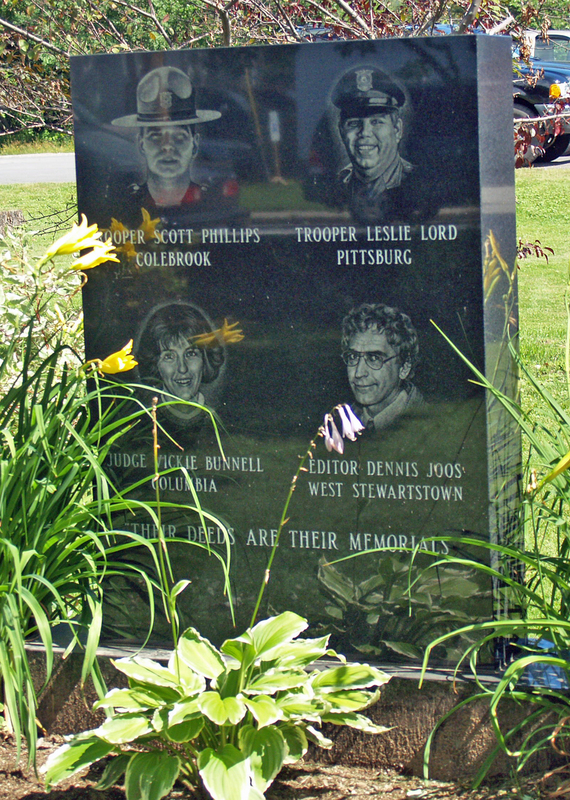 Memorial stones were set in Pittsburg and in Colebrook, in the park next to the News and Sentinel. An act of the legislature changed the name of Blue Mountain in Columbia to Bunnell Mountain and 10,000 acres was designated as the Vickie Bunnell Preserve. In August 1998, hundreds of firefighters and police officers descended on Pittsburg one weekend to build a badly needed fire station, an effort Lord, who was the town’s fire chief, and others had been working on for years. When it was dedicated later that year, it was signed Pittsburg Fire Station. Underneath, it reads Spirit Station, in honor of the spirit and camaraderie that brought people together to make the idea a reality. Perhaps no where is the memory strongest of the fallen than in the Colebrook District Court, where longtime court clerk Jan Corliss assembled pictures to hang on the wall at the rear of the court room. Behind the judge’s desk at the front of the room, a portrait of Bunnell hangs. In their individual roles, the four had the courtroom in common. Bunnell was the judge, before whom Phillips and Lord would present cases. Joos would cover court day for the newspaper. After the shooting, Corliss talked with counselors and she took their advice to heart. The pictures, which feature Lord and Phillips in their police uniforms, Bunnell relaxing with her dog, Tallack, and Joos at the ocean. A yellow ribbon is placed in the center of the photo collection. Corliss keeps the ribbons fresh and tidy. Sometimes, she changes it out. In May, she placed a black ribbon, following the line-of-duty death of Franconia police Cpl. Bruce Mckay. North of downtown Colebrook, at the rest stop on Route 3, visitors can learn about the northern part of the state at the Great North Woods Interpretive Center. Ten years ago, it was an idea enthusiastically embraced by Bunnell. Charlie Jordan and Bunnell worked together on a committee that eventually developed plans for the center. Both had attended a meeting in early August 1997 as plans began taking off. “Then everything just happened after that,” said Jordan, who publishes the weekly Colebrook Chronicle. Eventually, the project got back on track. In the corner of the center is a piano that belonged Bunnell, where a group of friends and fellow Kiwanians brought it when it needed to find a home a few years ago. At 7 a.m. today, at the State Police barracks in Twin Mountain, there will be an annual remembrance, not only for Phillips and Lord, but for the other troopers who died in the line of duty. A green flag, bearing their call numbers that frame a vignette of the region, will be raised and brief ceremony conducted.